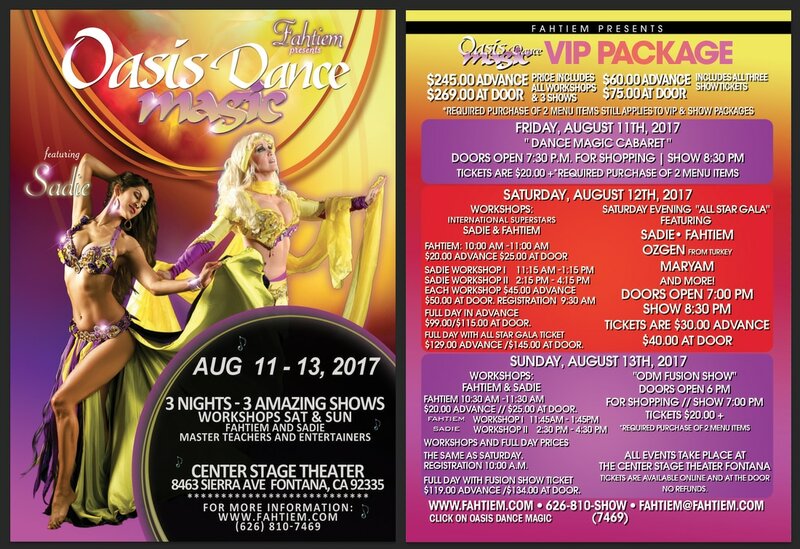 Join us August 11th - 13th for Oasis Dance Magic 2017, a weekend full of International entertainment, Belly Dance workshops and master classes and shopping! 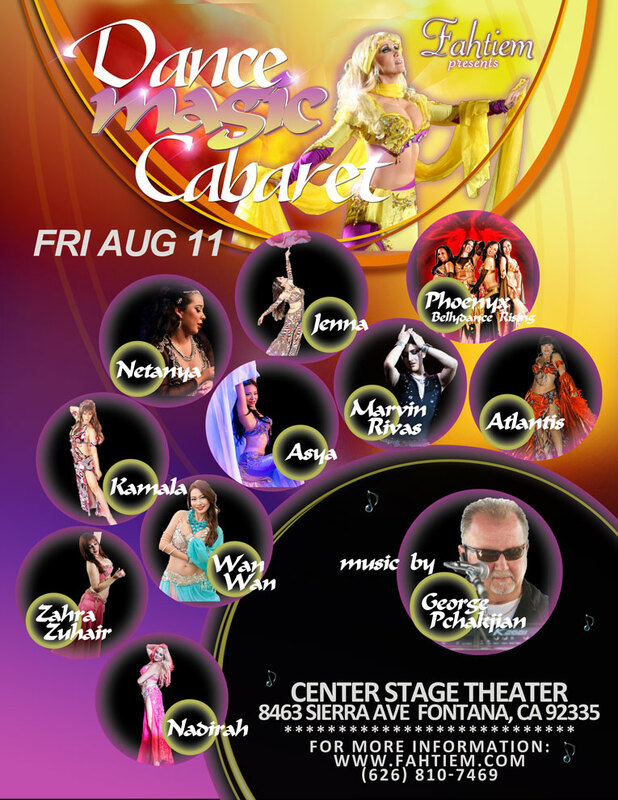 Kick off the weekend on Friday, August 11th at the Dance Magic Cabaret. This evening of entertainment in a supper club setting will feature some of today’s best “up and coming” Belly Dance talent. Enjoy the show, dinner, and a cocktail! On Saturday a gala show featuring some of the top names in Belly Dance and exciting dance and musical performances in many other styles. This international show will feature the talents of Sadie, Fahtiem, and many more! Finish off the weekend on Sunday evening with a fun evening of Fusion Belly Dancing with some of So Cal's finest fusion dancers. Workshops will take place on Saturday and Sunday mornings and afternoons. All classes on Sat, Aug 12th are sold to capacity. Sunday classes & all shows are still available. Please call the box office for details (909-429-7469). A gala show featuring some of the top names in Belly Dance and exciting dance and musical performances in many other styles. This international show will feature the talents of Sadie, Fahtiem, and many more! "Baladi Tango Fusion" The emotive Baladi meets the passion of the Tango in this dynamic and sensual workshop! Learn the history, technique and expression of both the Egyptian Baladi and Argentinian Tango. We will work on creating signature Baladi expressions, languid movements and strong accents and combine them together with fiery Tango footwork, poses and lines. Then we will put it all together in Sadie's newest choreography to the all-new music from Khader Ahmad's "Dum Tak Revolution Vol.3"
"Shimmmmmmmy Time!" The shimmy is the dancer's fingerprint. No two people will shimmy the same. Having a strong shimmy is an essential part of the bellydancer's repertoire. Are you ready to develop your signature shimmy? This workshop will cover the many variations of shimmies as well as add some exciting layers and Sadie's signature shimmy combos. It's a great workout and enhances coordination. Get ready to sweat and shimmy like you never have before! "Flawless Flow" Steps are always taken, but it's what is in between the steps that creates the MAGIC. With superstar combos and technique. "Samba Fusion" The Brazilian Samba is one of the world's most fun and celebrated dances! This workshop will break down some of the most popular moves and foot patterns in the Samba no Pé, the soloist dance seen at Rio's Carnaval. We will then add those pulsating rhythms and movements to the hypnotic sounds and moves of bellydance for one SPICY workshop you don't want to miss! VIP Price Includes 10 Hours of Workshops & All 3 Shows!